Kevin Davidson of Carmel won a divisional title at 140 pounds. It was sectional qualifying week for area high school wrestling programs, as dozens of teams competed at four different sites in divisionals last Saturday— all hoping to advance to… Please login below or purchase a subscription to the Putnam County Courier to access this content. Carmel keeper Marc Glaviano stretches to make save as Mahopac’s Tyler Gysek (21) can’t quite get to puck in Mahopac’s win last Friday. 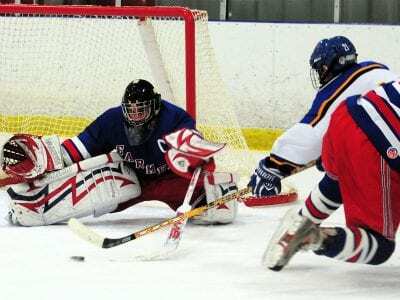 ( The Mahopac High hockey team split two tough games last week, losing 5-0 to Pawling at Pawling Trinity on Saturd… Please login below or purchase a subscription to the Putnam County Courier to access this content. 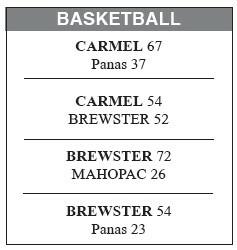 CARMEL—The Carmel High girls basketball team ripped Panas, 67- 37, Monday at Carmel High, and the Rams also topped Brewster, 54-52, last Wednesday to sweep the season series from the Bears. Brewster also dominated Mahopac, 72-26, Frida… Please login below or purchase a subscription to the Putnam County Courier to access this content. Former Carmel High wrestling standout Mike Rose was named the Springfield College Athlete of the Week recently, after earning three wins over nationally ranked opponents at 125 pounds. Rose, ranked No. 7 in his weight class in New England, go… Please login below or purchase a subscription to the Putnam County Courier to access this content. CARMEL—The Carmel High hockey team split a pair of conference games this week, losing to Mahopac on Friday, before bouncing back against Kennedy/ Putnam Valley on Sunday. The Rams are now 10-8 this season, 6-7 against league opponents. O… Please login below or purchase a subscription to the Putnam County Courier to access this content. BREWSTER—The Brewster High boys basketball team earned a 62-56 overtime victory over Mahopac last Friday at Mahopac, two days after the Bears dropped Carmel, 51-39 at home. The two wins left Brewster at 13-4 overall, and 7-2 in League … Please login below or purchase a subscription to the Putnam County Courier to access this content. SOMERS—Joe Smith had 15 points and Matt Schoen added 14 to lead the Kennedy Catholic High boys basketball team to a 74-64 victory over Dover in a league game Monday at Dover. 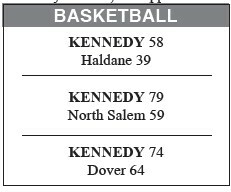 Kennedy also routed Haldane, 58-39, last Friday at home, and… Please login below or purchase a subscription to the Putnam County Courier to access this content. PUTNAM VALLEY—The John F. Kennedy Catholic/Putnam Valley high ice hockey team had two league games this past weekend. They lost to Carmel 3-0 on Sunday and beat Lakeland/Panas 6-4 on Friday, both games were held at Brewster Ice Arena. … Please login below or purchase a subscription to the Putnam County Courier to access this content.